Linda has created a group of truly outstanding miniatures and small pots for us. Each one has its own uniqueness. They are all hand coiled and traditionally fired. 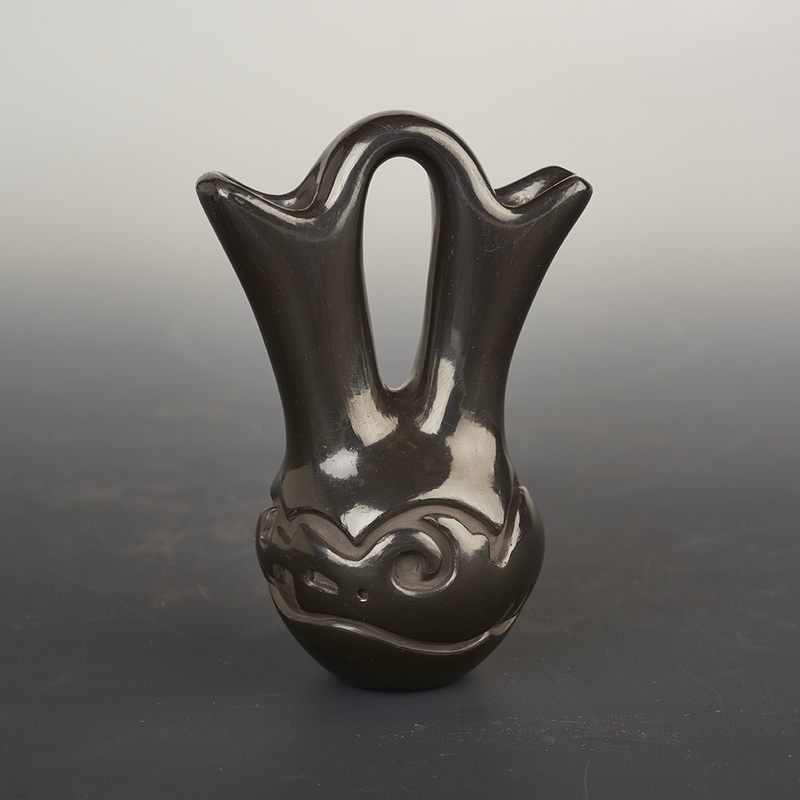 This first one is a classic wedding vase with a carved avanyu (water serpent) Linda’s avanyus ae always curved and flowing. The coiling of this shape is always challenging, making sure the spouts are evenly spaced and size. This is a lovely example of that form. Born in 1962, Linda is the granddaughter of Santa Clara Pueblo pottery matriarch Margaret Tafoya and the daughter of Lee and Betty Tafoya. Growing up in a family of potters, she has long been exposed to the art form, and she began making her first pieces at the age of twelve. 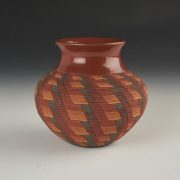 Her father taught her to make the vessels and carve the designs, while her mother taught her the sanding and polishing. Renowned for his firing technique, her father, Lee, showed her how to perfectly fire her pottery a deep black while maintaining its high shine. 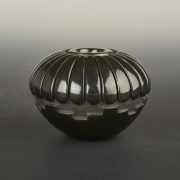 Linda is known for her graceful, magnificently carved designs. Both her firing techniques and her polishing is exceptional. Linda lived at the San Juan Pueblo for years, during her first marriage. She began designing her work with some traditional San Juan imagery. In the late 1980s, she began using a micaceous slip to complement the polished and matte surfaces of her pottery. She has won numerous awards at the Santa Fe Indian Market including “Best of Division” in pottery. She was on the front cover of New Mexico Magazine in August, 2006 and a featured artist in the 2011 Santa Fe Indian Market Magazine.